In industries supporting the mining industry, another 160,000 people are employed in the US. Every American uses over 47,000 pounds of mined products each year. 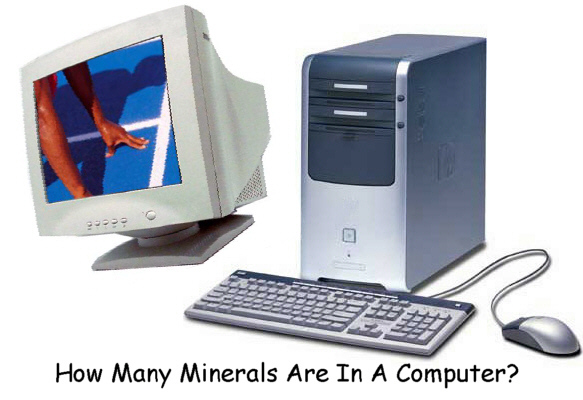 Mined minerals and materials made from those minerals account for over $33,000,000,000 each year. The USA is the 3d largest producer of gold, and second largest producer of copper in the world. In Canada (our northern neighbor), in the western province of British Columbia alone, mining accounts for $3,000,000,000/year in revenues and over $89,000,000 per year in taxes. In a study by the Mining Association of British Columbia, "Mining represents the highest value use to which a hectare of land can be utilized." What Some Metals and Minerals Are Used For In Modern Society. COPPER About 13 millions tons of copper are currently used annually (1998). Copper is used for electrical conductors, motors, appliances, piping and in metal alloys. GOLD Gold has many high tech applications including computers and many scientific instruments, is used in electrical conductors, is used in the face shields of fire fighters to reflect the heat of a fire. is used in building windows for reflecting the heat from the sun, medical and dental equipment, and jewelry. ZINC ZnO is used to prevent Sunburn, zinc is used for protective coatings for steel, casting alloys and extensively in medicines. NICKEL Nickel is primarily used to manufacture stainless steel. SILVER Silver is used in electrical conductors, photography, chemical manufacturing, dental and medical uses. IRON Iron is used in steel manufacturing, magnets, medicines, biomedical research, paints, printing inks, plastics, cosmetics, dyes. Iron is used in volume, about 20 times more than any other metal in our society. BORAX Borax is used to make fiberglass, high temperature glass, cleaning agents, ceramics, wood preservitives, corrosion inhibitors and fertilizers. TITANIUM Titanium is used in paint manufacture as pigments, and in plastic manufacture, as well as many high strength, low weight metal alloys. TALC Talc is used in paper manufacture, in paint manufacture and in plastics and the cosmetic industry. CLAY Used to make cement and concrete, which is used to build roads, buildings, housing foundations and even driveways. POTASH Carbonate of potassium, is used in fertilizers, medicines and the chemical industry. RARE EARTH ELEMENTS Planthanum, Cerium, Praseodymium, Neodymium, Europium, etc., are used in petroleum refining, computers, televisions, magnetic industry, metallurgical applications, ceramics and lighting. This list of minerals and mined materials is only a very small fraction of the materials that originate in a mine, which we use in our everyday lives and business.